Continuing with the great response from the Docker Monitoring post. I am following up by investigating the setup of Prometheus. I first discovered Prometheus while making some changes to the cAdvisor documentation and noticed that cAdvisor now integrates with Prometheus. So what is Prometheus? Prometheus was a solution created by SoundCloud (Yes, that SoundCloud). ~~As current Docker monitoring solutions were not scratching their itch they decided to roll their own solution to suit their needs. Thankfully SoundCloud decided to Open Source Prometheus back in January 2015 as it is a great product. Take a look at the [SoundCloud's blog](back in January 2015) for more details about the release. ~~ UPDATE: Tobi from Sound Cloud clarified this paragraph. Sound Cloud created Prometheus as a general monitoring solution that recently integrated Docker. Also, Prometheus has been open source sine the beginning but only announced beginning of this year. Thanks Tobi! OK, enough beating around the bush. How the heck can we deploy a Prometheus Docker Monitoring stack? I spent a lot of time fine tuning the docker-compose file so you can easily stand up a Prometheus stack with all the required components to quickly get up and running. Before we get started installing the Prometheus stack. Ensure you install docker-compose on your Docker host machine. Clone the project Prometheus Monitoring Project locally to your Docker host. If you would like to change which targets should be monitored or make configuration changes edit the /prom/prometheus.yml file. The targets section. The targets section is where you define which componets(data exporters) should be monitored by Prometheus. The names defined in this file are actually sourced from the service name in the docker-compose file. If you wish to change names of the services change the "container_name" parameter in the docker-compose.yml file. 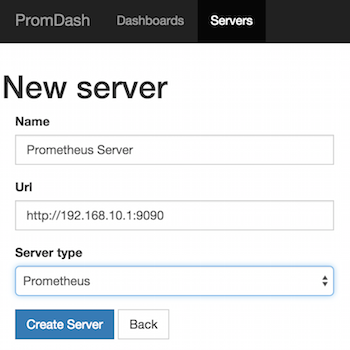 Now we need to connect the Prometheus Dashboard to the Prometheus installation. Access the Prom Dash as mentioned above. Input desired name, Prometheus server IP and port (http://<Host IP Address>:9090> ) and select Prometheus for server type. Let's create our first Dashboard. Head over up to the Dashboard menu. First, create a new directory. Next, create a new Dashboard. Here's a quick Dashboard I put together as an example.